Almost original citizen of South Kalimantan is Banjar tribe which is consist of sub tribe, it is Maayan, Lawangan and Bukiat and also has interference with Malay, Java and Bugis tribe. The main identity which is shown is Banjar language as a general medium. New comer citizen is like Java, Malay, Madura and Bugis has come to South Kalimantan for a long time. Malay tribe comes since Sriwijaya Kingdom or as the trader who is staying there. Java tribe come in Majapahit Kingdom even before and Bugis people come and build Pagatan Kingdom in the past. Maayan tribe, Lawangan, Bukit and Ngaju is influenced by Malay culture and Java. It is joined by Budhas’ Kingdom, Hindu and the last is Islam or From Banjar Kingdom, so it makes the Banjar tribe which speaks in Banjar language. Banjar kingdom in 16 and 17 century has a relation with Sultanate of Demak and Mataram. This Kingdom was not slipped away from strange country like Holland and England which is alternately come from Banjar’s anchorage.When there were a fight to Holland in 29 century, there are leader is like Sultan Hidayat and Prince Antasari dace Holland. Tradition people of South Kalimantan especially Banjar tribe know a lot of tradition ceremony which is about human life, from the time that human is in uterus until the death. For example: there are prohibition for pregnant woman tradition, Babalas Bidan ceremony when the baby born is 40 days old and also give the name. Marriage ceremony which is consisting of some part, Sajaka Babasasulus is looking for the candidate wife data, Badatang is asking for the hand parents. Bantar Patalian is to give a set of goods or bride price, Qur’an and the top ceremony is Batatai bride or sit in stage, Last is Pemakanan Pengantin, Both of bride and groom go though the honeymoon for 7 days and 7 nights to eat and drink behind the close screen. In Banjar people, they have developed the literature art and beautiful voice art which come from daily association. One of them is tease each other, sometimes they use poem and Pantun and ones, it is humor between the young generations. This tease in a long time had been changing to become a beautiful literature art until today. For example is aphorism. Fine art, Banjar tribe knows about the beautiful embroidery and usually use as the equipment of ceremony carved art. In the building of house or mosque; they have carved object which is made by wood, also in equipment industry from brass, it is like place for Betel Vine, Cuspidor, Bokor, Kapit, Abun and soon. Cane work from Pandanus or rattan, generally doing by women to fill up their free time is increased in other territory. To building art especially for house building, the Banjar people has had the high value of architecture, traditional house is like grand stand house with the highly roof. If you see from side of the house, it is like pyramid. This grand stand houses id different with other because we can know from social class of the owner. A long time ago that house is devided into some high people of group; it is like nobility, the leader of Muslim and trader. They have high Bebungan house which is known as Gajah Baliku, Palimasan Palimbangan, Gajak Manyusu, Balai Laki house and Balai bini house. In the other hand common house are Cacak Burung houses, Tadah Alas house, Gudang house or common cottage. Generally, the houses for common people have cross cubic shape or long cubic. The black color on the Banjarese house in both South Kalimantan and Banjarmasin’s coat of arms represent the high culture of Banjar people. As a Banjarese, it’s my duty to appreciate and promote our own heritage. So from now on I will try to write about our culture. For the first article I choose to do an overview of Traditional Architecture of Banjar people, the reason is because I’ve written parts of the article about this specific matter in Wikipedia, so it’s easier for me. These types of houses could still be found in South Kalimantan, but unfortunately they are in a bad shape to say the least. Such a shame, because their existence resonates the glory of our past. Not only we should preserve it for the sake of our heritage, but because this type of houses was built with great consideration and expertise. Traditional dwellings in Indonesia have developed to respond to natural environmental conditions, particularly Indonesia’s hot and wet monsoonal climate. Banjarese traditional vernacular homes are built on stilts. A raised floor serves a number of purposes: it allows breeze to moderate the hot tropical temperatures; it elevates the dwelling above stormwater runoff and mud; allows houses to be built on rivers and wetland margins; keeps people, goods and food from dampness and moisture; lifts living quarters above malaria-carrying mosquitos; and the house is much less affected by dry rot and termites. “Modern” houses which most Banjarese prefer nowadays don’t have that kind of sensibility. Among the 4 Kalimantan provinces in Indonesia, South Kalimantan is the only one that depicts our traditional house in our province’s coat of arm. The house in those particular coat of arms is the one named as “Bubungan Tinggi”, the style of “kraton” (royal palace) with its signature 45ºsteep roof. In the days of our kingdom, this was the type of house that a royalty would live in (although in time this type of house were also built by commoners). The house is built with the philosophy of harmony between the upper world and the under world. Gajah Baliku: this particular style of house was intended for the closest relatives of the ruler. Gajah Manyusu: the type of house of the nobles or “pagustian”, the ones who bore the title of “gusti”. Balai Laki: the type of house for high officials such as the ministers. Balai Bini: they type of house for the ladies of the court, such as women of nobility and nannies of the court. Palimbangan: the type of house for high clerics and big merchants. Palimasan (Rumah Gajah): this type of house was where gold, silver and other precious belongings kept. Anjung Surung (Cacak Burung): This is the type of house of commoners. The shape of this house if seen from above is the shape of a cross(+), that is why it is also known as RumahCacak Burung. Tadah Alas: A development of the Balai Bini style. Joglo Gudang: This type of house has the roof that is similar to Joglo (Javanese-style house),hence the name. While the name “Gudang” (which means “storehouse”) was given because the lower part of the house is usually used to store things. This feature makes this type of house is the preferred style of the Chinese-ethnicity who live in South Kalimantan. Bangun Gudang: a type of traditional house in South Kalimantan. Do you know Francisco Domingo Joaquim? 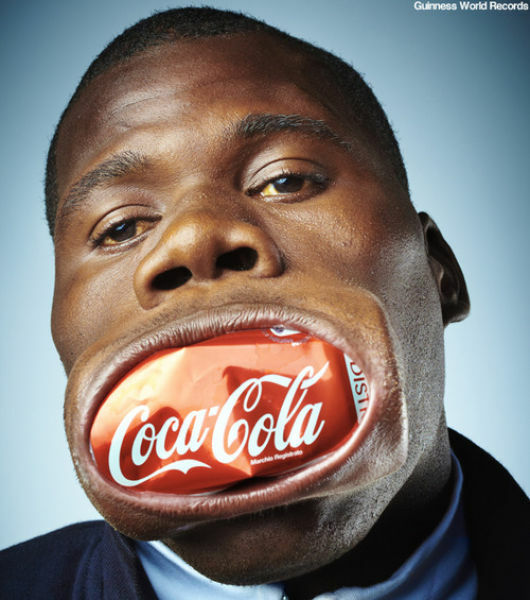 this man fromangola breaks the records for the world’s widest mouth on the new Guinness Book of Records 2011. his mouth is 6.69 inches wide and can fit in a Coca-Cola can sideways. can you imagine how wide is his mouth? 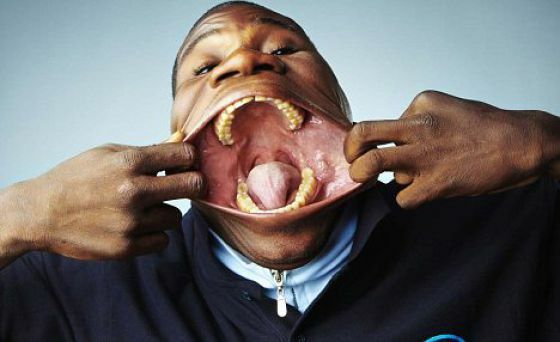 The 20-year-old from Sambizanga in Angola has the unusual ability to fit an entire 330ml can of soda in his mouth, sideways. 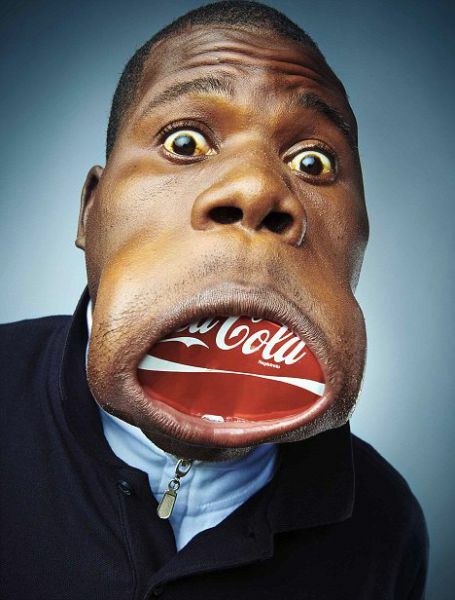 Joaquim, also known as “Chiquinho”, recently appeared on an Italian TV show where he amazed crowds by placing and removing a can of coke from his mouth 14 times in under a minute. 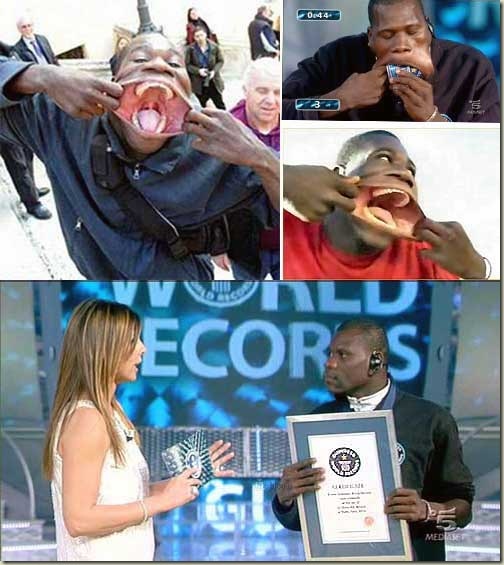 Known as “The Jaw of Awe”, Francisco is said to have shot to fame after showing off his ‘talent’ at local markets and football games. The new record holder says it’s a “dream come true” to be featured in the new Guinness World Records 2011 book. Corsets were tremendously popular in Victorian times (during the 1800s), when they were often strengthened with pieces of whalebone. Corsets smidgen the waist, and if worn for a long time they can everlastingly change the shape of the waistline, and nowdays corset turns into a unique fashion style for woman, mostly for lingerie fashion. 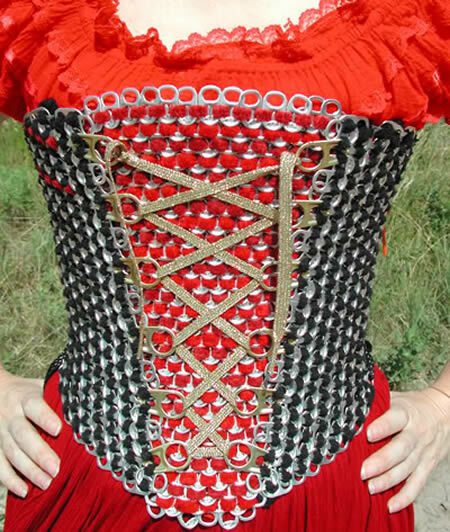 Previously we have posted about Cathy Jung the Woman with the smallest waist in the world which is also known as the corset addicts and now how about if we introduced you to this bizarre and unusual corsets design, Check it out. 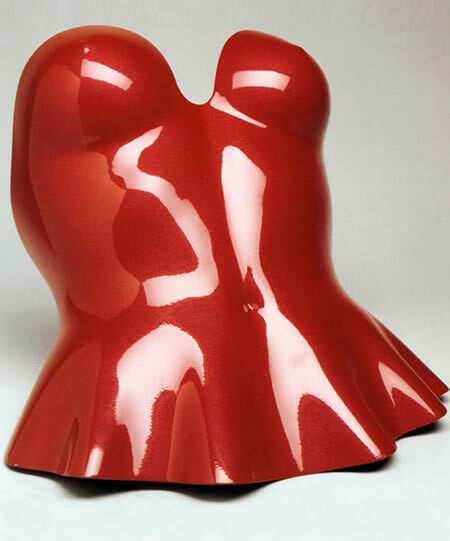 Apparently somebody out there with a serious Mario fetish has decided to create a corset using his likeness. Overed with rare 1980s Super Mario Brothers fabric, this oddity was created by TheVintageDoctor. Complete with a lace-up back with metal grommets, Mario will help you keep your waistline in check in case you gobble down too many 1UP mushrooms. California based costume and corset maker Evening Arwen has released a pair of fancy unlicensed corsets based on the costumes of Darth Vader ($600) and the Imperial Storm Troopers ($500). “No Galactic Ruler should been seen with a purse so we’ve provided you with storage compartments in your utility belt, suitable for holding the keys to your starship and your communication device. Only a swishy cape can make a grand entrance really grand so we’ve also attached one to the matching shrug. And to finish things off, we’ve also provided a pair of gauntlets that can fit over most regular sized dress gloves. Be the center of attention at the next costume party you attend in this one of a kind ensemble created especially for the Norwescon 32 Fannish Fetish Fashion Show. Inspired by Pretty Alice from Harlan Ellison’s classic story “‘Repent Harlequin!’ said the Ticktockman,” the corset is made of three layers of fabric: a cotton coutil inner-lining for stability, a layer of micro corduroy for texture, and two-tone rust colored taffeta that has been torn in many places to allow the natural beauty of the bleach-distressed micro corduroy peek through. 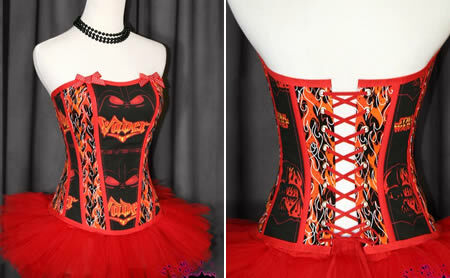 This outfit consists of a silver corset top with diagonal quilting detail. A grid of red, blue, green, and gold LEDs is embedded in the corset, and designed to fade and flash in a variety of patterns to suit your mood. This Piranha caught by Jeremy Wade’s was known as one of thebiggest piranha caught ever, with 5feet long and 100lbs weighing, this predator fish was looks very scary, here’s the story of Jeremy Wade who has caught this rare piranha species in congo rivers, Jeremy Wade was known as a famous fisherman fromAnimal Planet’s River Monsters. While he was on a fishing expedition with his crew in Africa, up theCongo River, the British angler made an amazing and rarely catch : he grappled with a giant piranha and managed to defeat the monster after a serious fight. The result was astonishing as the 52-year-old fisherman pulled out of water a 5ft longgoliath tigerfish and held it with both arms for fear of being bitten by its 32 razor-sharp teeth that have the same dimensions as those of a white shark. The goliath tigerfish is well known as being one of the most dangerous freshwater fish in the world, so Wade said he was extremely cautious when he pulled it out of water. The 100lbs monster hasn’t been caught more than a few times before because of its ferocity and its habitat, which is very hard to reach. The giant piranha seems to consume prey the same size at itself and there have been cases when others have seen it tearing apart crocodiles or even people. Check out more of the Giant Sea Monster here. and the story of Steve Wozniak a man who catch 1000 different fish species. Here’s the terrifying Giant Piranha that was caught by Jeremy Wade’s on Congo Rivers. Need a Unique and Unusual Wedding theme for your wedding ceremony? need a fresh idea to celebrate your most beautiful days? here’s some of the most unique and unusual wedding themes ever. check it out, some of this wedding themes was previously posted on our blogs. But the ultimate thrill-seekers’ wedding doesn’t have to end there – once the wedding party have all been lowered back to earth, guests can head skywards again – for a floating reception. Wedding guests are wowed with a three-course wedding breakfast – all while strapped in to the dining chairs. The cost for such a spectacular ceremony? Around £25,000., Check this Bizarre Bungee Jumping Wedding Themes for another picture of this unique wedding theme. 6. Married with Dead Boyfriend. Despite her unbearable pain, Michelle organised a “wedding” in the morgue of Oxford’s John Radcliffe Hospital, where Kevin lay dead. The touching ceremony – witnessed by close family and friends – was conducted by the hospital’s Catholic priest who administered the last rites to Kevin. In front of an open coffin, the priest blessed the wedding rings that Michelle had bought specially for the service. Their two children, James, now five, and Megan, now four, went to their daddy’s funeral wearing the clothes they would have worn to their parents’ wedding. The priest asked Michelle if she would have taken Kevin to be her “lawful wedded husband” and she replied “I do.” Kevin’s dad Paddy placed a ring on Michelle’s finger and a ring was placed on Kevin’s finger as he lay in the coffin. See another unique wedding when a girls married her dead boyfriend after he dies for six years. You don’t have to be Dale Earnhardt Jr. to find love in the fast lane. Last Valentine’s Day, 31 NASCAR-loving couples said “I do” at the Daytona International Speedway; thousands of fans, friends, and family looked on from the stands. The pair, Bryan Willey and Stacee Kennedy, even exchanged rings NASCAR-style: with tattoos. The track also offers nongroup wedding packages that include two race passes, a bottle of champagne, a notary public, and the option to hold your reception in a room overlooking the famous track. These snaps from January 2007 show grooms carrying their brides during a mini marathon celebrating the New Year in China’s Hainan province. See More stories aboutMini Marathon Wedding Theme. Love or marriage are not about simple physical beauty and appearances, everybody’s free to do what he/she wants with his/her body so I just have to wish them a happy life… but I still don’t understand this passion of body modifications like tattoos, piercings and implants… – this guy has them all. look how this guy using an implants in his forehead to make it looks like a horn. not only that, but he also tattooed his inner lips, More Pictures of Body Modification Fans Wedding..
We’ll go to attending the wedding ceremony of superman and wonderwoman oh yeah please don’t forget to wear your superhero costume. such as spiderman, batman or whatever you want. More stories and Pictures about Superheroes Wedding Themes. the bride and groom use star wars costume on their wedding ceremony so here is the star wars marriage event. Till Death do us Wedding, This Centipede King and Scorpion Queen uses the real centipede and Scorpions as their face ornaments. really scary wedding theme. Well actually there’s many more unique wedding themes that you can choose for your wedding ceremony. In this aerial photo, a giant landslide under a residential street which claimed a car and left another car hanging over the edge is seen in Schmalkalden, central Germany, Monday, Nov. 1, 2010. The cause of the landslide is yet unclear unclear. Residents were evacuated from 23 buildings. Nobody was injured. 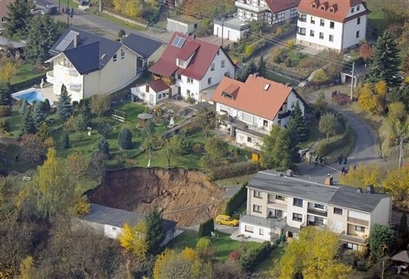 In this aerial photo, a giant landslide under a residential street is seen in Schmalkalden, central Germany, Monday, Nov. 1, 2010. 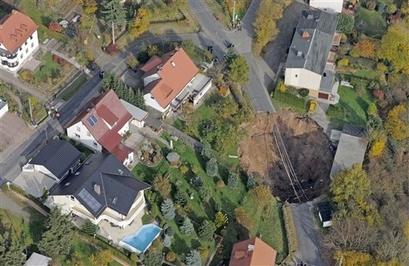 A general view of a large crater that appeared in the early hours in the central German town of Schmalkalden, November 1, 2010. 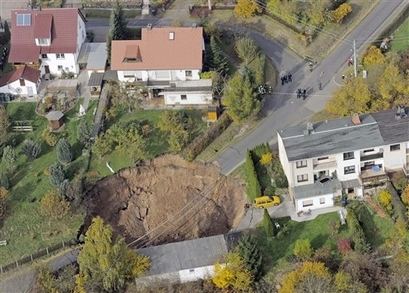 A huge crater measuring 30 by 40 metres has opened up in the middle of a residential estate, according to local police. I think someday also will be happened in Lapindo Mud Sidoarjo Indonesia…….. When… ????????? Careers in community bedrocks like schools, hospitals, and law firms are here to stay. Everyone’s heard about outsourcing and job cuts. That’s the bad news. The good news is that while the economy is changing and employment patterns are evolving, there are some bedrock institutions – and jobs – that aren’t going away. Just take a look around and you’ll see examples of jobs that are here to stay, at least in some capacity. Almost every community, big or small, has a medical office, a law firm, a school, a police department, a drugstore and other “bedrocks” that provide employment. Job Forecast: The U.S. Department of Labor anticipates employment of police officers to grow 10 percent from 2008 to 2018 (about as fast as the average for all occupations). And, as the Department of Labor notes, police officers who lose their jobs due to budget cuts usually have very little trouble finding jobs with other agencies. Training: If you’re thinking about becoming a police officer, look into earning a criminal justice degree to help you on your way. Pay: Police officers have an average annual salary of $51,410. Differences in salary largely depend on location. The highest ten percent average at more than $79,680. In this world of contracts and litigation, lawyers are essential to local businesses and individuals – and paralegals, who help lawyers prepare for trials and prepare legal arguments, are essential to lawyers. Job Forecast: The Department of Labor expects a 28 percent growth rate for these jobs between 2008 and 2018. They also anticipate the need for more paralegals as intellectual property, health care, elder issues, and environmental law become increasingly important to our communities. Training: If you’re interested in pursuing a paralegal career, check out associate’s degree programs in paralegal studies. If you already have a bachelor’s degree, consider earning a paralegal certificate. Pay: Paralegal salaries can vary. Working for a large law firm or in a big city, for example, will typically pay more. The average annual salary for paralegals is around $46,120, though the top ten percent can earn more than $73,450. In addition to a salary, many paralegals receive bonuses. Whether you live in a big city or small town, there’s probably an accounting firm that many neighborhood businesses use. And it’s no surprise – accountants do a lot more than just prepare taxes. Local businesses rely on them for everything from bookkeeping to helping plan growth strategies. Job Forecast: Accountants are important advisors and team members for our local business communities, and as the number of businesses increase, so will the number of jobs for accountants. The Department of Labor estimates employment of accountants will grow by 22 percent between 2008 and 2018. Training: If you want to become an accountant, consider earning your bachelor’s degree in accounting or a related field. You can advance your career by earning your Certified Public Accountant (CPA) certification. Pay: Accountants have an average annual salary of $59,430, with top earners averaging at more than $102,380 per year. Accountants who provide services for private businesses typically earn more than accountants who work for state or local governments. Health care administrators help improve the quality of health care; control costs; interface with insurance companies; and oversee patient record security. At first glance it might not be clear why these jobs are essential to every community, but as the health care industry expands we will need administrators to help keep hospitals and physician’s offices running smoothly. Job Forecast: The Department of Labor predicts that employment of medical and health services managers will grow 16 percent from 2008 to 2018. Training: A bachelor’s degree in health care administration should prepare you for an entry-level position in a smaller facility or department. For larger facilities, consider a master’s degree in health services administration. Pay: Health care administrators have an average annual salary of $80,240. Higher salaries tend to be found in hospital settings. People rely on their local pharmacy for their prescription needs. Pharmacy technicians help ensure that those pharmacies run smoothly and efficiently. With health care changes, more people will have prescription drug coverage, which will put a greater demand on local pharmacies – and as a result, increase the need for pharmacy technicians. Job Forecast: This is another career with much higher than average employment growth anticipated. The Department of Labor expects employment of pharmacy technicians to grow 25 percent from 2008 to 2018 according to the Department of Labor. That’s 96,300 new jobs! Training: Pharmacy associate’s degrees or certificate programs are a good way to go if you’re interested in a career as a pharmacy technician. Pay: Pharmacy technicians earn $13.32 per hour on average, though the highest 10 percent can earn more than $18.98. Keep in mind that certified technicians may earn more than non-certified technicians. People need to physically visit their health care providers – or have their health care providers come to them – in order to get the care they need, which makes nurses essential to local communities. Job Forecast: Many employers are currently reporting difficulty in hiring enough RNs to handle their current workload, and more jobs will become available as the numbers of our elderly continue to grow. According to the Department of Labor, employment of registered nurses is expected to grow by 22 percent from 2008 to 2018. Training: To become a registered nurse, you’ll need a bachelor’s of science degree in nursing (BSN), an associate degree in nursing (ADN), or a diploma from an approved nursing program. You’ll also need to complete a national licensing examination in order to obtain a nursing license. Pay: Registered nurses have an average annual salary of $62,450. Nurses working in hospitals generally have higher salaries than those employed in nursing care facilities. The top ten percent of registered nurses average at about $92,240 per year. Whether your town’s population is 500 or 5,000, every community needs schools and teachers. Teachers provide an essential service that cannot be outsourced. And while times may be tough in education right now, the kids aren’t going anywhere. Job Forecast: The Department of Labor expects employment of kindergarten, elementary, middle, and secondary school teachers to grow by 13 percent between 2008 and 2018. There is an even higher demand for teachers who specialize in mathematics, science, and bilingual education. Training: If you’re ready to start your career as a teacher, you’ll need a bachelor’s degree from a teacher education program. If you want to be a secondary school teacher, major in the subject you plan to teach and take a program of study in teacher preparation. Pay: The average annual salary of kindergarten, elementary, middle, and secondary school teachers ranges from $47,100 to $51,180. According to the American Federation of Teachers, beginning teachers with a bachelor’s degree earn an average of $33,227. Getting a master’s degree or national certification can also get you a raise in pay. Unless otherwise noted, all salary information is from the U.S. Department of Labor’s Occupational Employment and Wages, May 2008.